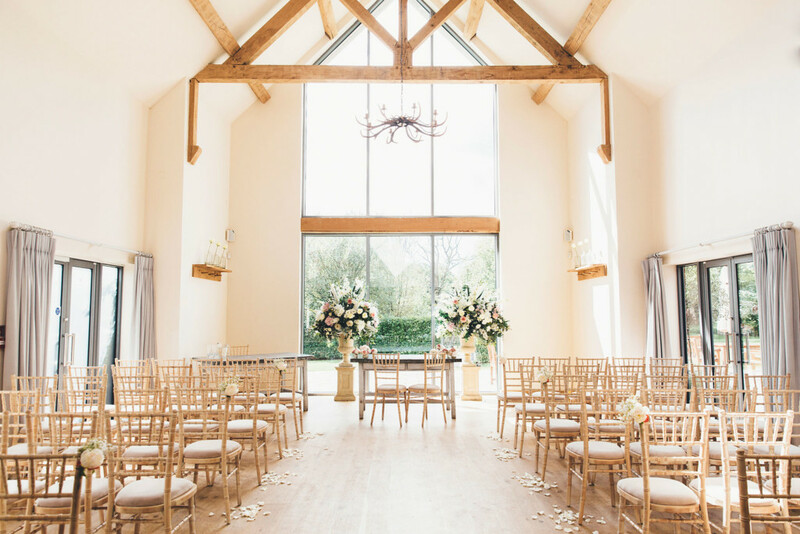 In August of last year, we hosted the utterly stunning Wedding Day of Mr & Mrs Levey & we’re very excited to be sharing a selection of images from E+L’s special day below. The vision that they had for their Wedding Day was so romantic; a vision that was optimised in their Ceremony flowers which were created by Seventh Heaven Events. Two beautiful floral urn arrangements, abundant with blowsy white, peach & blush flowers framed the Ceremony Barn, they also had delicate floral pew ends & rose petals lining the aisle for E’s entrance. The sensational arrangements didn’t end there, as Seventh Heaven also made abounding centrepieces for each table, the soft colour palette of which went perfectly against the white table linen & metallic vases & candle holders. The Wedding Cake, which was such a gorgeous focal point in the Dining Barn, was created by Rachelles Cakes. A three tiered, marble effect cake with gold leaf & stunning handmade flowers. Such a delicate, show-stopping design & oh so elegant. The Bride & Groom thought of every little detail when planning their day & their stationery really took centre stage. Particularly the incredible acrylic engraved ‘Welcome to our Beginning’ sign hung by our bi-fold doors, which was later replaced with their exquisite seating plan, all created by the talented duo that are Two Little Birds. In charge of capturing all of the beautiful details & the love & emotion of the day was Leanne Jade, who did so perfectly from those special getting ready moments, all the way through until the the first dance. Thank you to Leanne for allowing us to share Mr & Mrs Levey’s day & the biggest thank you of all goes to E+L for allowing us to be a part of what was such a special day. Wishing you so much happiness in your married lives together!